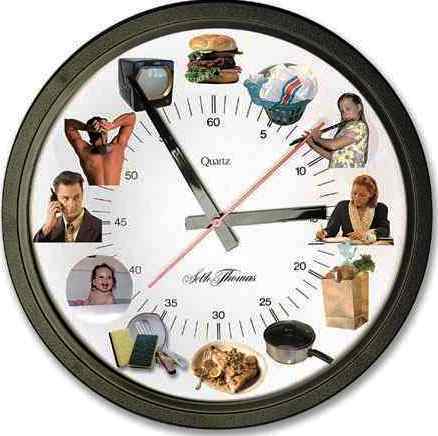 Generally, time management refers to the development of processes and tools that increase efficiency and productivity. You can improve your time management skills by doing nothing. Sounds impossible? Okay you’re right; you have to do something but not very much. The skill of time management is about knowing what to do and when. Does it ever feel like there is never enough time in the day? Are you always rushing? Do you feel stressed at the end of the day? Do you believe that you are not accomplishing what you hoped? Better time management may be the answer. We must “protect, organize and prioritize our time”. If you are having any of the above listed difficulties, then my guess is you are missing at least one of those elements. Protecting our time is important. Your time is your gift to spend, as you will. You can spend it wisely or you can waste it. It’s your choice. However, one thing you can’t do is get it back to do over again. Sometimes we all do things that we don’t really want to be doing but when we do, it should be in furtherance of a bigger goal that we have. Maybe we don’t want to be going to work today but we want to collect our paycheck at the end of the week, so it’s something we choose to do to get to the bigger payoff. However, there are things that we do that just aren’t important, don’t lead to anything and waste our time. Can you think of any activities that fall into that category for you? I have three general categories for which I like to protect my time. One is for making progress toward my work/life goals. These are the things I do to move me forward in life. These are generally geared toward helping people in some way, generating more clientèle, and increasing my revenue streams. In this category, it is my sincere hope that one day I will have enough income to hire out all those necessary jobs that I don’t love to do so that I can focus all my time on the things that are my passion but until that time, there are still things I do to move myself forward that I don’t totally love. The second category would be spending time with people I care about—those people who nurture me. I protect time for the special person in my life, my extended family and my friends. There are some people whom I avoid when I am protecting my time. They are the ones who generally take more than they give. Do you have people like that in your life? If they can’t be totally eliminated, at least minimize the time you give to these people. The third category would be simply things that bring me pleasure or joy. There are things I do that I can do alone or with others when I need relaxation. I like to read a good book, watch a good movie, blog etc. Protect your time so that you get to do the things that bring you joy. Did you know that the average person’s mind wanders around seven to eight times a minute? Developing good work habits that include staying focused until the job is done is critical to organization. Prioritizing your time has to do with deciding what’s most important. I said I have three categories—goal-oriented actions, time with important people and time doing enjoyable activities. They don’t necessarily prioritize in that order. A healthy balance is necessary for good time management and a healthy lifestyle. Therefore, time management is often thought of or presented as a set of time management skills; the theory is that once we master the time management skills, we’ll be more organized, efficient, and happier. Previous story Why Invest in Blue Chip Stocks? Wow, i like all what you have write. I will add your blog to bookmark and waiting with forward on new posts. Go on. Take care and have a nice day!! Thanks Drew for your kind words. I bookmarked you your blog too. it is too good that information.take care and have a nice time for you. Thanks for very helpful information.